Prepare the sushi rice by mixing cooked rice with sushi vinegar. Lay one sheet of nori on the bamboo mat. Spread evenly the sushi rice over the nori. 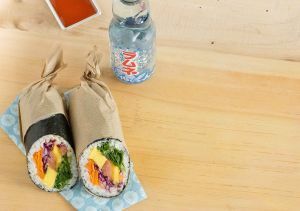 Place the salmon, Japanese omelette, red cabbage, carrot, avocado and mango in the center of the rice. Spread the mango sauce and Kewpie mayonnaise. Cover with cilantro and salad. Roll the maki. Wrap it in paper, cut it in half. Serve them with additional mango sauce.